Construction Mediation Services In Denver, CO | Schlueter, Mahoney & Ross, P.C. Many companies are surprised to learn that not all disputes over construction end in a courtroom. When all parties are amenable and willing to work for a solution, mediation can be an excellent option. Construction mediation in Denver, Colorado involves working with a neutral third party to resolve the dispute. Typically, the two parties are not bound by any kind of resolution that the third party proposes, although different circumstances may be negotiated on a case by case basis. The role of the mediator is to encourage dialogue between both parties, ultimately leading to a resolution between them. The construction attorneys at Schlueter, Mahoney & Ross P.C. 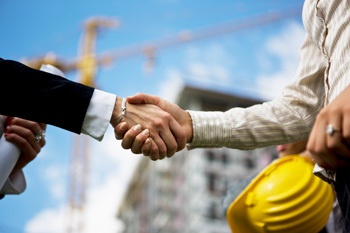 have provided construction mediation services to Denver, CO companies of all sizes. From custom builders dealing with boutique homes to developments, design firms, and everything in between, we understand the mediation climate that exists here in Denver. Our attorneys have the knowledge and experience to help your business get the most out of construction mediation in Denver, Colorado, reaching a fair settlement that could potentially yield substantial savings versus taking the matter to court. If a case begins in mediation, but cannot be resolved there, our construction lawyers specializing in construction mediation services in Denver, CO can adjust their strategy for a strong courtroom performance. If you need services other than construction mediation in Denver, Colorado, we have the strong legal knowledge and litigation background to represent you in construction litigation or construction arbitration. However your case may develop, you can rely on Schlueter, Mahoney & Ross P.C. for strong representation and sound legal counsel.